Hearing Stories at Mamakas While Wondering if Mikey, Despite his Ancestry.com Results, Will Like it. I’m fascinated by the latest round of ancestry.com commercials. In particular, there is one where some middle aged guy, after thinking he was German for 50 years, went onto the website and found out he was Scottish. In addition, he seemed quite happy about exchanging the lederhosen for a kilt. I have a problem with this. If I found out that I wasn’t the nationality I thought I was after 5 decades, I’d be pissed. Immediate questions like “Did we have a Scottish mailman or a nanny?”would pop into my head. I would also have a frank discussion with my parents about the significance of properly relaying important information, such as where the hell I came from , to my siblings and I. That said, there are times I wish my family history was a little more exciting. I’m at least a third generation Canadian so ties to my homeland are as faded as memories of the last time England won the World Cup. I’ve mentioned before that my mom has always been a good cook but it would be a stretch to say she was authentic. Her cabbage rolls, for example, are stuffed with precooked hamburger, minute rice and parmesan cheese. I have longed to be able to latch onto a culture and call it my own, especially from a food perspective. After a rather boring diet for the first 20 years of my life, I finally was able to experience authentic ethnic food. I remember working with a doctor from Thailand who introduced me to the first Tom Yum soup I’ve ever had. To this day, it is etched in my brain as one of the best things I’ve ever eaten. Most culture’s foods are quite ubiquitous now. Even in sleepy towns like London, Ontario, there is a surge in the availability of international fare. Toronto is like a diner’s Disneyland, allowing any of us to be Korean, Indian or Jamaican for a day. In other words, I’m a little jealous of people with well rooted histories and stories from the old world. Narratives of Sri Lankan perusing markets selling fresh mangosteen or eating carnitas in the alleys of Mexico city sound far more exciting that chasing the Dickie Dee guy down the street to get one of those ghost shapes ice cream bars with the frozen, tooth-cracking gumballs in the middle of a luke warm day in Sudbury. What overcomes the jealousy a bit is when I dine with them and get to see and experience the pride they have in their culture’s food. Specifically, when it comes to Greek food, my experience was limited growing up. The Apollo was the main gig in town and I rarely went. At home, my mom didn’t know what a greek salad was. Since then, I’ve hit a number of Greek places through my triple D expeditions. Usually, these traditional eateries are pleasantly tacky, often decorated with blue and white colours, flags and pictures of architecture of the homeland hanging on the wall. I’ve also come to realize that every second diner, even if it doesn’t serve souvlaki (although it usually does), is owned by a Grecian. In fact, a Greek friend of mine owns a sports bar in London and I can bet on two things; good food and continuous reminders that, as opposed to England, Greece has won the Euro Cup whereas England’s World Cup win was even earlier than the last Leaf’s Stanley Cup victory. I was surprised to hear a Greek place would harbour itself along Ossington, one of the more volatile and finicky streets on the whole Toronto dining map. That said, it keeps getting rave reviews. I was particularly interested to go since I was with a couple of colleagues who in some way have Grecian ties . I knew I would be treated to narratives which would nicely compliment some of the dishes that came out and would be a little more exciting than mine which involve the fact that my kids really like my horribly predictable (but decent) chicken souvlaki dinner. The decor is less tacky than most Greek places and was actually fresh and bright, especially for an Ossington joint. It was bustling but there were no worries because they actually take reservations. It had wine that night so I can’t comment on the cocktails. Despite the fact that Greek wine is not as renowned as some it’s chest pumping European neighbours, Mamaka’s stick to their heritage by offering krasi of all types (about 15 white and red options) and price points ranging from $45 to $120. We opted for the $45 Sofos organic and the $60 Kidonista whites. Although neither were the best whites I’ve ever had, they were as crisp and clean as the joint itself and well worth the reasonable price. The first lesson from my table mates was that among the many dips available in a Greek restaurant, taramosalata is a better choice than tzatziki. Made with fish roe mixed with other traditional Greek ingredients like lemon and oil, it has a pink hue and is quite salty. It was served with cucumber and pita. It’s a bit of a surreal spread and seemed synonymous with marmite from my British roots. I didn’t need a lesson to understand the significance of octopus in Grecian cuisine but I did need one to understand Santorini fava. My knowledge of fava beans include their cameo in a Hannibal Lecter speech in “The Silence of the Lambs” and from my dietitian training in which I learned that they fact they cannot be consumed by segments of the world’s population due to favism, a genetic disorder in which there is insufficient glucose-6-phosphate dehydrogenase in red blood cells, leading to acute hemolytic anemia. Ironically, many Greeks carry this genetic abnormality which also protects from malaria . That said, Santorini fava has nothing to do with fava beans. In fact, it is similar to a hummus made with yellow split peas and flavoured with onions (in this case pickled…soooo Ossington) and capers. This dish was delightful and a nice change from the potato and olive combo which seems to accompany the mollusc everywhere else. Once again, through stories at the table I was transported to a large Greek family dinner featuring Kokoretsi, a lamb offal sausage complimented with skordalia (a garlic potato taste). I was told stories of a grandmother, who did not want to waste a scrap of food, working meticulously to season and stuff everything into an awaiting casing with great success. 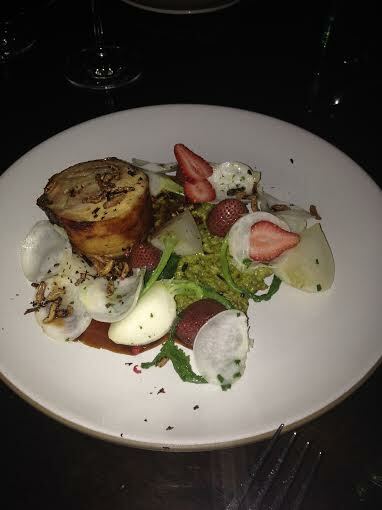 Although I’m not a lamb fan, I couldn’t complain…it tasted like I was there. For a side we had tiganites patates which were fries topped with a little feat, egg and spicy sauce. In other words, it’s Greek poutine. As I’ve said before, it’s hard to mess up fries and I will eat an egg on anything so I wasn’t disappointed. Mamakas proves that Greek food can be as funky and cool as their Korean, Cuban or Vietnamese neighbours. This restaurant breaks the mold of predictable, diner-like atmospheres and instead offers a cool and sleek vibe. The food includes standard fare such as lamb and spanakopita but also transforms traditional but lesser known dishes into modern small plates which still emphasis the concept of family style dining. I often go to medical conferences (which would perhaps discuss glucose-6-phosphate dehydrogenase) but don’t usually participate in the guided poster presentations which provide audio commentary to accompany the visual data. When it comes to dining, however, I’m singing a different tune. Listening to my colleagues reminisce about family gatherings rooted in old world traditions in the context of Mamakas decor, vibe and food makes me want to declare myself a culinary pyromaniac, break dishes and scream “Opa!” at the top of my lungs for at least a few hours before reverting to my sullen, ale-swigging distant English eating habits. In the end, I’ve realized I don’t need ancestry.com. Being a United Kingdom mutt allows me to be a bit of an impartial chameleon when it comes to the diversity of cultural food choices out there. I think restaurant owners perceive there is as much a benefit in appeasing the clueless white guy as there is members of the ethnicity they represent. I feel I’m kind of like Mikey form the iconic life cereal commercials as many of the chefs anxiously stare at me wondering if, after a short period of consideration, I will like it. In a previous blog, I outlined my Masterchef tryout in some detail. Despite my failure to impress the producers, I watched the show and was happy to see Eric Chong win. I was equally happy to see something tangible come from his win; a new restaurant in the perilous region of Chinatown. R&D is a partnership with the mercurial Alvin Leung, who’s blue hair makes old ladies and smurfs alike quite envious. The restaurant’s concept is one of polarity and contrast. Our bubbly waitress promised flavours which ran the gamut of tastes and flavours with every bite. The name R and D refers to the Rebel and Demon personas of the owners and is a play on the fact they were both engineers before finding their true vocation. Adding to the polarity is Eric’s calm demeanor coupled with the mad science antics of his partner. I asked the enthusiastic waitress for menu recommendations. 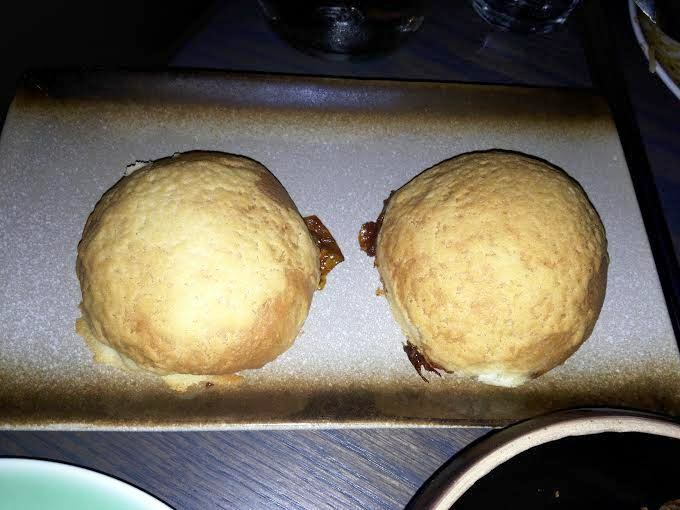 She recommended pretty much everything on the menu but in particular raved about he CSB buns. They cook them hourly and getting one might be synonymous with scoring a Black Friday deal. Once out of the oven, the waitstaff wrestle for them in the hope they can secure them for the patrons at their tables. I drank the Kool-aid and insisted that we secure some of this precious loot. Did we manage to get them????? The drink list comprises of Asian inspired potent potables derived from a collection of traditional cocktails. The Whisky sour is splashed with lemongrass, coriander, pepper and yuzu liqueur. The pina colada is served as boozy bubble tea. The 510 ceasar (which I ended up ordering), was made with garlic and mushroom infused vodka and seasoned with hoison Worcestershire sauce. Mushroom flavour was prominent and heat from the chili sauce was a little shy. The drink was topped with Nori which added a pleasant element of unami. 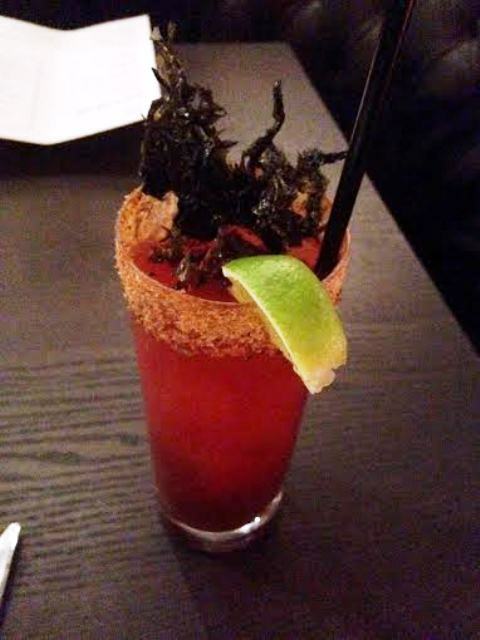 All in all, it was a good Caesar but was a little small in volume which probably helped to intensify the aforementioned flavours. The first dish to arrive was Eric’s Curry. 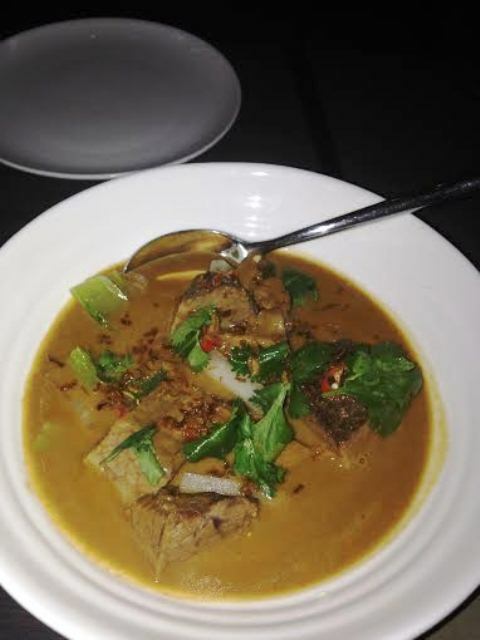 Beef brisket sat in a pool of curry sauce and mustard greens. It was brilliantly unique. A little salt and sweet and a lot of sour and heat made this great to eat (that’s poetry for you left brained science types). At the time, the dish came with no medium to absorb the sauce (a true engineering flaw) which really was shameful considering how good the sauce was. Maybe we can call it an early oversight since it appears based on the website the dish now comes with coconut rice. Probably the best dish of the night. 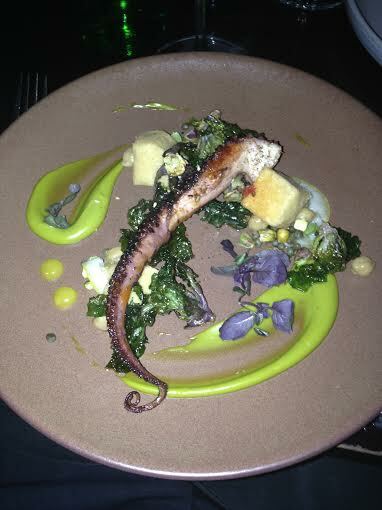 Next was the octopus which was served with eggplant and choy sum chimichurri. The presentation was a little sad but the octopus was nicely prepared and finished with a decent char. The eggpplant was clever as a replacement to the normal routine of potatoes or olives and the chimichurri was deliciously unorthadox yet had a familiar flavour I couldn’t quite pinpoint but wanted more. Shortly after we received the Tom Yum Little Dragon buns ($6). 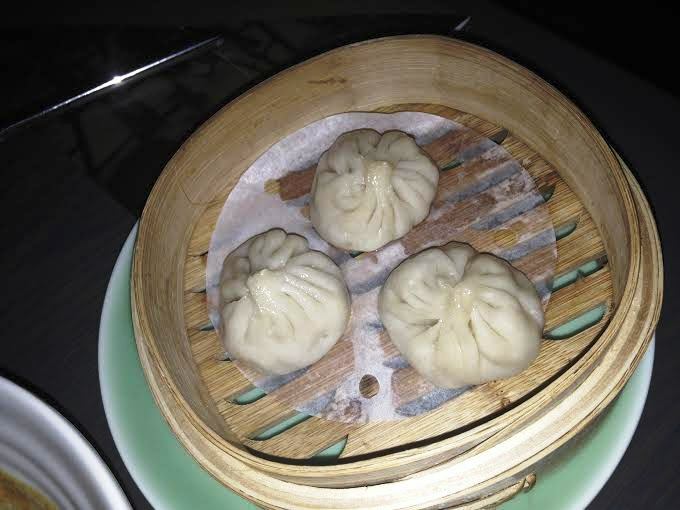 I imagine that Thai flavours in a Chinese bun may be considered as engineerial as calling a soup dumpling a dragon bun but in the end they hit the mark on flavour and were a pleasant bite. 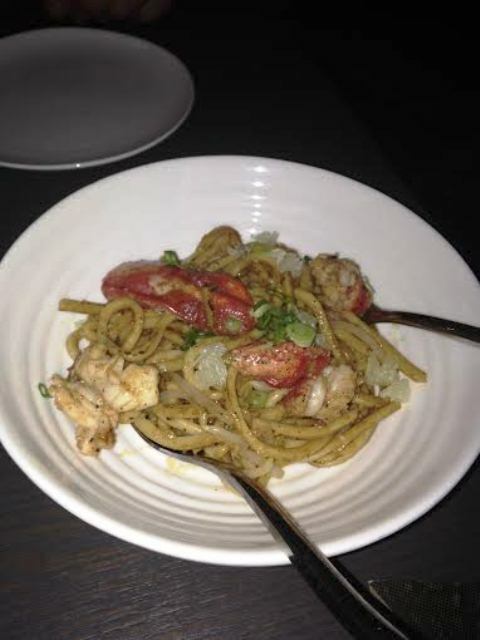 I was a little reluctant to try the lobster chow mein ($25) but my colleague talked me into it. Despite a reasonably sized portion of lobster, it was horribly predictable and had no wow factor at all. 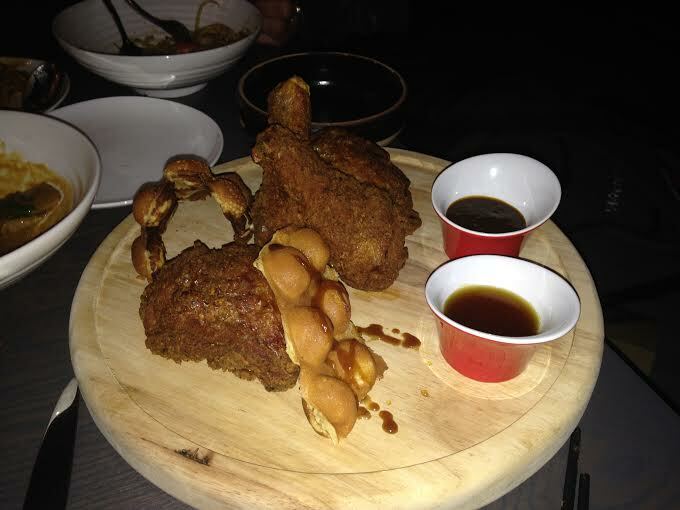 The one platter were ordered was the general saunders’ chicken served with kung pao sauce, sichuan maple syrup, and HK egg waffles. The chicken was nicely seasoned and super moist. The kung pao sauce was delicious and I think the maple syrup is probably an acquired taste but I took the advice of the waitress and mixed the two together which created a mixture which satisfied a number of taste sensations. The waffle portion was a little skimpy but complemented the chicken well in their spin of this traditional southern dish. At this point there a bit of a mad scramble around the kitchen which suggested one thing..the buns were ready. Although I was getting rather full, I couldn’t resist the urge to indulge and our waitress, like a trooper, emerged with an order. The pork filling was a bit scant a certainly played second fiddle to the delicious bread. They were delightfully warm and just a little sweet and filled my need for gimmickry nicely. At this point I was quite stuffed but another colleague showed up and ordered the beef tartare. 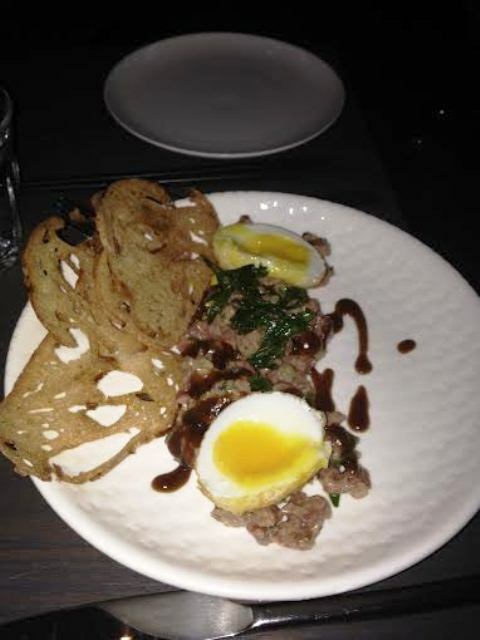 The spin was the son and law egg with the sauce served on top of the beef. I had mixed feelings about this one, probably beacuse I’m a bit of a traditionalist when it comes to this dish in particular. I think the beef should be the star and thought the sauce, although matching nicely with the egg, masked the flavour of the beef a little too much. 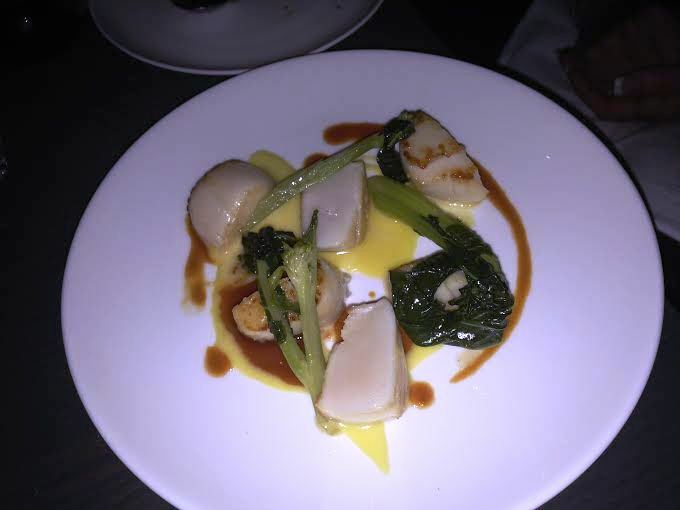 She also ordered the scallop which was served with hot sauce, chinese greens and sichuan hollandaise. It was hard to put my finger on it, but the dish lacked balance. The heat and bitterness was prominent but it lack sweetness. Maybe the thought was that the scallop would provide enough sweetness to offset the flavours of the hollandaise and Chinese greens. The scallop itself was cooked near perfectly other than lacking a good sear (which affected both its colour and what might have been a necessary caramelization). Personally, I would have kicked up the sweetness of the hollandaise or replaced it all together. The Asian fusion concept of R&D is certainly a better fit for Spadina than Strata 241 was. It is a well calculated project with all the fixings of a nouveau Toronto eatery; celebrity chefs, old school rap “fusion food”. I was surprised a bit by Eric’s kitchen demeanor. He was extremely stoic and methodical, focusing more at the task at hand than shining in the limelight as Canada’s first masterchef winner. It’s like he was in a 2 hour mystery box challenge. Like the show, there was a combination of great and not so good dishes. The curry was hands down the best dish of the night. The chicken, octopus, buns and tartare were more than acceptable and the lobster chow mein and scallops were a bit of a train wreck. Also like the show, there was gimmickry and hype lead by the promise of extreme flavours with every dish that didn’t always come to fruition. Much like a television show, the success of R&D will depend on loyalists who will continue to go after trying it once for the novelty, Eric’s ongoing commitment and whether or not people will be able to tolerate Alvin Leung for anymore than a season of Masterchef. SPQR had me fooled. Given it was awarded a Michelin star for fine Italian food, I expected a stuffy, polite, quaint restaurant filled with overdressed waitstaff who pour wine with one hand behind their back. My first suspicion that I was wrong is when I walked past it a few nights before on my way from State Bird Provisions to Altier Crenn. From the outside, the vibe seemed more hipster than a classic Italian joint with the presence of surprisingly pounding, quaky rhythms as opposed to uncle Vito playing the violin table side. I emailed quite a bit in advance to see if I could secure a table of 6 for a group I was with at a conference. They told me such as table was not available but when I got on open table I was able to secure two tables of 4 at the same time. It seemed odd to me…sorta pretentious;quite risible in fact. On the day of, I was a real nuisance and called to see if we could combine of two tables of 4 into one table of 5 due to a few last minute cancellations. They hesitantly accommodated us but once I walked in, I understood the issue. The restaurant is not designed for large groups. Small tables are crammed into every square foot of the smallish dining area. When seated, one of us ended up stuck in a swelling, protruding, quillon-resembling seat which blocked the path of everybody walking by. The menu changes frequently but usually focuses on a decent array of appetizers, a number of pasta dishes and a few mains. There is no doubt the pasta is the cornerstone of the menu given the fact there are usually a dozen or so smart, piquant, quirky rations available at any given time. 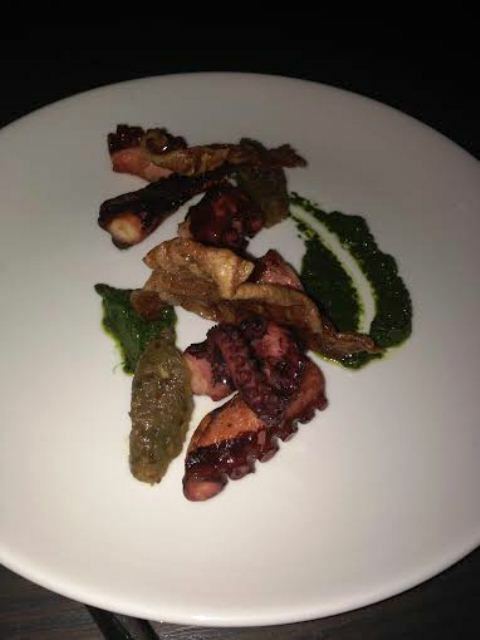 I started with the octopus garnished with kale sprouts, panissa (a lemon chick pea cake) and a vibrant puree laced with pistachio. Chick peas and octopus work so well together and the panissa was a creative and enjoyable way to marry the flavours . 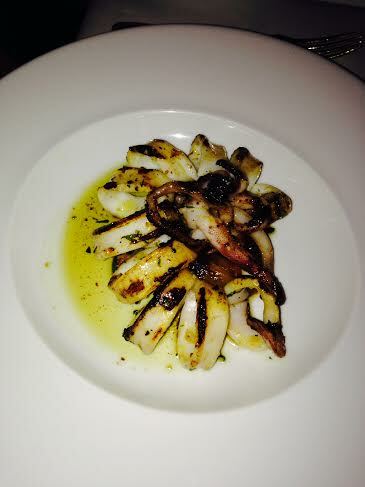 The octopus was tender and the subtle use of lemon accented everything well. Although I didn’t opt for the pasta, members of my dining party did and I had the opportunity to try a few bites of each. 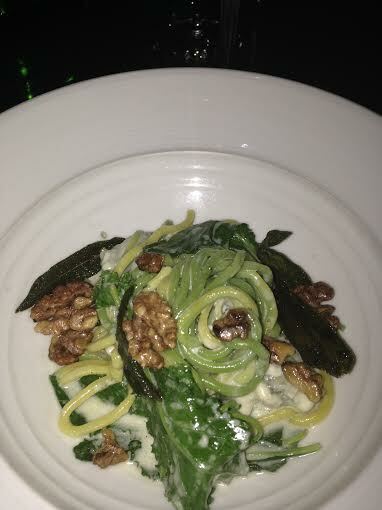 The bucatini “straw and hay”, california blue cheese, linden walnut, kale and sage brown butter ($26) was a delightful interpretation of this popular combination. Whole walnuts and sage leaves along with large pieces of kale made it a visually appealing dish which was able to balance the intensity of the rich cheese sauce. Another tablemate chose the famed and in the eyes of some, risky blutnudlen which sounds more horrific than the assassination of Julius Caesar. 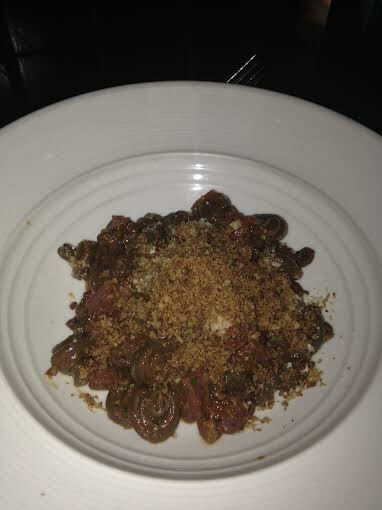 This popular dish mixes blood pasta with blood sausage ragu and pig’s foot breadcrumbs ($25). I must admit it was a novelty to try but beyond a few bites a sanguine pasta queming ravenous hipsters is not my cup of tea. It was rich and flavourful and reminded me why, as a pseudo-Catholic, my consumption of blood tends to stop at transubstantiation. I couldn’t imagine finishing the whole plate. Instead of pasta, I opted for the Guinea hen “rosticceria style”, wild rice porridge, roasted strawberry, turnip and pink pepper ($36). The presentation was a pleasant mess. The delcious hen was almost hidden among the colours of the Italian flag. The texture was somewhat reminiscent of a good shawarma. The meat was crispy but held in its moisture. The wild rice porridge was vibrant and the strawberries sweetened the pot. The sulphur of the turnip rounded the plate out. We decided on a family style approach to dessert and ordered a trio which included 1. fried blueberry pie, butterscotch, lemon curd and burnt sugar gelato, 2. hibiscus bombolini, cherry vanilla, cherry bark vanilla and fior di latte gelato and 3. peanut and milk chocolate pudding , malt and chocolate gelato. The consensus at the table was that the bombolini was the best followed by the pudding and the fried blueberry pie (all $14). The blueberry pie was the one I was most excited about but there were too many flavours and the butterscotch didn’t really fit. 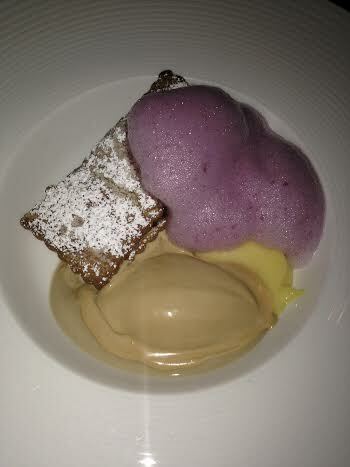 The pudding was boring looking and tasted almost the same. 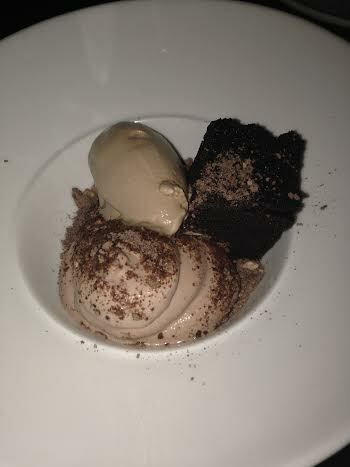 It was very predictable which was kind of odd given the dishes which led up to dessert. I come to critique SPQR, not to praise it. And graciously hath SPQR answer’d it. Come I to speak in Fareeatales. SPQR is a perfect fit for Fillmore Street in San Francisco. It ignores the traditional concepts of fine Italian dining by presenting beautiful dishes but throws away the spacious room filled with white linen in favour of a labyrinth of small table scattered throughout a broom closet. The service was characteristic of the latter with the staff dressed in black as opposed to a shirt and tie. The food was delicious and deserves the accolades it has received over the years. That said, I have to agree with many that say the food is somewhat pricey; quasi-ridiculous in fact. Perhaps Herod had a role in charging $25 for pasta and $14 for dessert. Despite this, the place is always jam packed so it doesn’t seem to deter the masses. In the end, when I polled my guests to see if they majority enjoyed the experience they agreed that it was stupendously polished;quorum reached. Tavern by Trevor is another example of the cross-pollination that is occurring in Toronto. Partly a way to jump on the small plate phenomenon that has taken the city by storm and partly a means of dealing with the inertia of local foodies to try surrounding neighborhoods, the tavern recently opened at the corner of Spadina and Richmond. 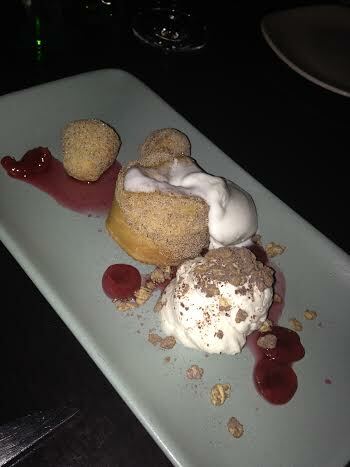 I was impressed by the small yet inventive and reasonably priced menu. Chef Trevor Wilkinson teams up with restaurateur Mike Yaworski in an odd couple type collaboration. Chef Trevor is the owner of Trevor Bar and Kitchen which has sustained the volatile Toronto dining scene while watching others come and go along the Wellington Street stretch. He also recently appeared as a contestant on Chopped Canada this past year. I arrived and decided to sit at the makeshift patio (a few tables plus a number of stools beneath a counter made of 2x4s which looked like an inventive RONA project) which took over part of the wide sidewalk along Spadina Avenue. The waitress was quick to arrive with the food and drink menus. Boozewise, there are three tap beer from the local Amsterdam brewery plus an array of bottles, big bottles and cans. The wine list has around 10 bottles of both red and white wine with most in the $40-60 range. There is also a half a dozen or so bourbons plus a small list of cocktails priced at $11/each. 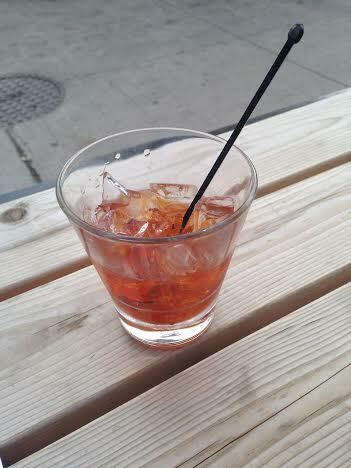 I started with an old-fashioned served with bourbon, sugar cube, angostura bitters and a lemon twist. It was a decent drink but was served with too much ice making it difficult to disperse the sugar which had settled at the bottom of the glass. For the most part, the food menu is structured by price points. All “Bar food” is $11, salads are $10, “from the stove” is $15 and entrees are $21. There are also a few sandwiches ($12-14) and sides are $5. There is also the ability to add a number of proteins to the salad. 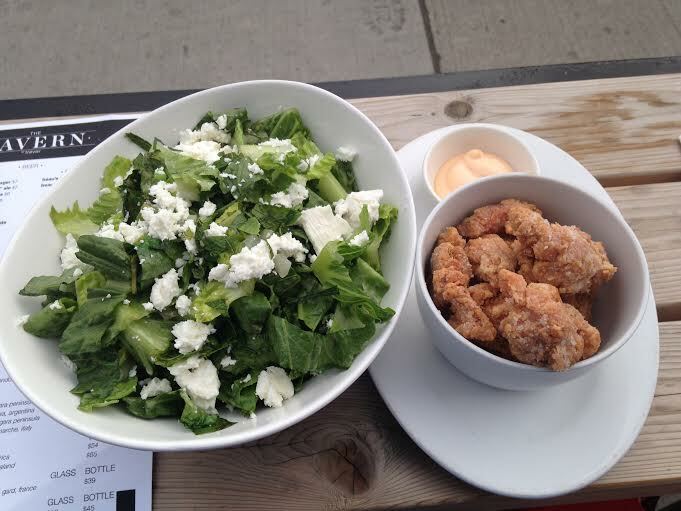 I ordered the green pea & lettuce with feta & mint salad and added ginger and garlic fried chicken. For the entree, I went with the bbq octopus, prawns & chorizo with fennel & radish in wild leek vinaigrette. That’s when things got bad. 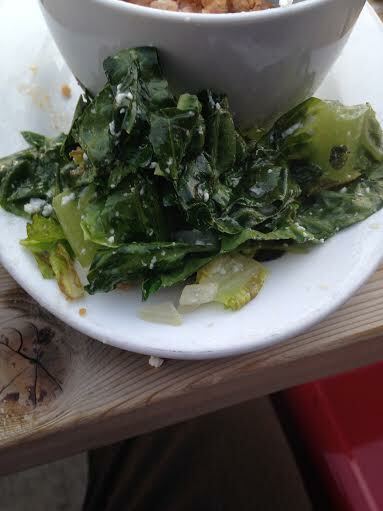 The salad arrived in a large white bowl and presentation was far from remarkable. The only lettuce was romaine and it was cut ribbon style with a knife (one of my pet peeves). I don’t know if the lettuce was warmed first or just not fresh because I found myself pulling out brown and wilted pieces. From what I could salvage, it was a good flavour combination but I certainly wasn’t enjoying the pea and feta hunting through a jungle of limp romaine. Turning my attention to the chicken, I was equally disappointed. It was boneless and served with an aioli. The pieces varied in size and thickness. I cut into the first thick piece and it was pink. A second thick piece was also pink. I cut into a third thinner piece and found it cooked properly and found the coating to be very tasty. When bringing this to the attention of the waitress, I was told that she just ordered it and it looked like that so it’s fine. She left only to return a few minutes later to tell me that she checked with the kitchen and in fact the chicken was cooked and it looked like that because it was dark meat. Then she proceeded to tell me that they were out of the octopus and asked if I would like anything else instead. I politely and thankfully said no. This is one of the worst dining experiences I have had in Toronto in a long time. First, serve a cocktail that can be consumed properly. Second, either use fresh romaine or don’t prepare it so it wilts. I thought the reason you used romaine was for the vibrant crunch. 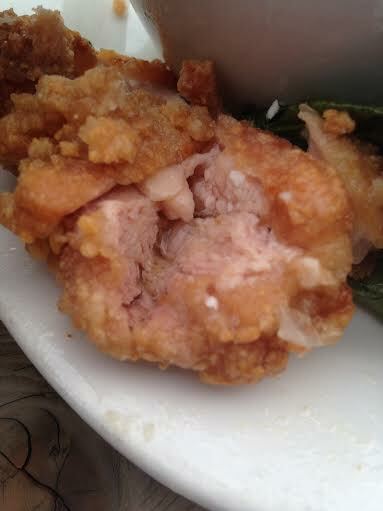 Third, if the chicken is pink it is undercooked and the fact that I didn’t eat it should be a hint that despite the reassurances from the waitress and the kitchen (who actually didn’t look at the chicken), I was not happy with the dish. As a footnote, I have asked 5 people since if the chicken looked undercooked based on the picture and all agreed unanimously. Fourth, it you are only going to offer three entrees on a menu, you shouldn’t run out of one. Furthermore, you shouldn’t wait until the customer orders it before you realize it’s not available. Fifth, if a customer is clearly unhappy with the experience, perhaps something should be done. Even an apology would have been sufficient. Instead, I left paying my bill having eaten only a few bites of salad and a couple of small, thin pieces of chicken. All I can say is this meal is a far cry from the Coq au Vin I had at Trevor Bar and Kitchen a few years ago. For serving wilted lettuce, raw chicken and not having octopus….Chef Wilkinson..you’ve been chopped. (I’m aware that in fact Chef Wilkinson did not in fact cook the food I attempted to eat but it is his name on the place!). Portugal reminds me of Canada in that both have major inferiority complexes. Canada lags behind the Americans in important things like Olympic gold medals, cheap book prices and more recent the value of the dollar. The states also have more restaurant chains, larger portion sizes, cheaper chicken nuggets and more childhood and adult obesity (although Canada is making valiant efforts to try and catch up on the latter). Portugal, on the other hand, is overshadowed by Italy, Spain and France. In a CNN travel report in 2012 examining the world’s most romantic nationalities, Spain, Italy and France placed 1,3, and 4 respectively while Portugal did not even make the top 10, finishing behind the Americans, Irish and Vietnamese. On the soccer pitch, Portugal historically lags behind their European rivals. Italy, France and Spain have all won european and world championships whereas Portugal is still seeking its elusive first win. There was some redemption recently when Portugal gained a world cup entry with an impressive second leg win over the Swedes. In addition, Portuguese phenom Cristiano Ronaldo took back the Ballon D’Or, the award for European soccer player of the year. Things are looking up. When looking at Toronto’s dining landscape, the big three reign supreme. Year after year, Italian, French and Spanish restaurants top critic’s lists of best in the GTA and many of the new trendy restaurants that have opened recently are Spanish tapas joints like Patria, Carmen and Bar Isabel. When asked about the big three, Joe Q Foodie will easily cite the fact that the cuisine is all about respecting the fresh ingredients and using simple cooking methods. 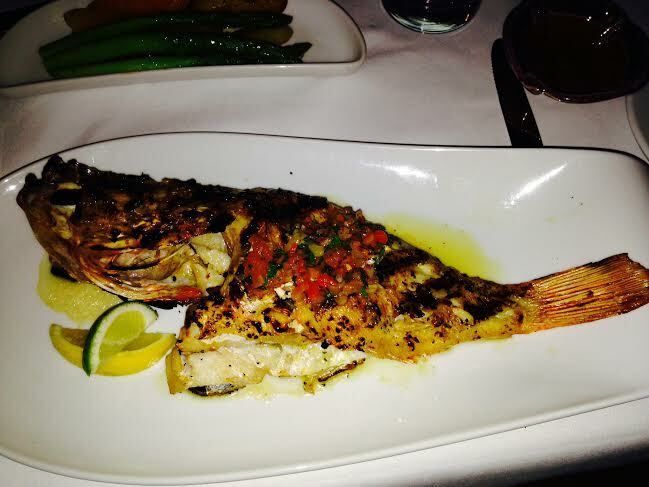 When asked about Portuguese cuisine, however, he will use his high school geography knowledge and assume fish. He faintly remembers Siri Siri sauce as he nervously shuffles his iPhone in his cardigan pocket wishing she was there to help (afterwards he secretly asks her only to be disappointed that she only brings up the wikipedia page for “sauce” but with more investigation discovers it’s actually piri piri sauce). After a pipe burst at Adega, my group was rerouted to Chiado on College street. It’s a quaint, attractive venue adorned with colourful paintings and well dressed waitstaff. We were seated promptly and received a very good explanation of the menu. One of the signatures of the service is the presentation of a fish platter; a visual aid boasting the wide array of available choices from the sea. Included in the mix were three whole fish choices. For the indecisive, they also offer a tasting plate featuring three cuts chosen at the chef’s discretion. Like soccer, the wines of Portugal are overshadowed by the products of Italy and France (I will politely leave Spain out of the equation). My experience with Portuguese wine has been limited to my mother buying one bottle of Mateus a year, having one glass and reserving the rest to clean silverware or something other household use. I was pleased to see a huge variety of wines from the mother county featured on the menu and quite enjoyed the poppy, fruity Luis Pato wine made with the Marie Gomes grape. I’m a sucker for a fringy type wine (I love Austrian Gruner for example) so I really liked it…maybe a little too much. 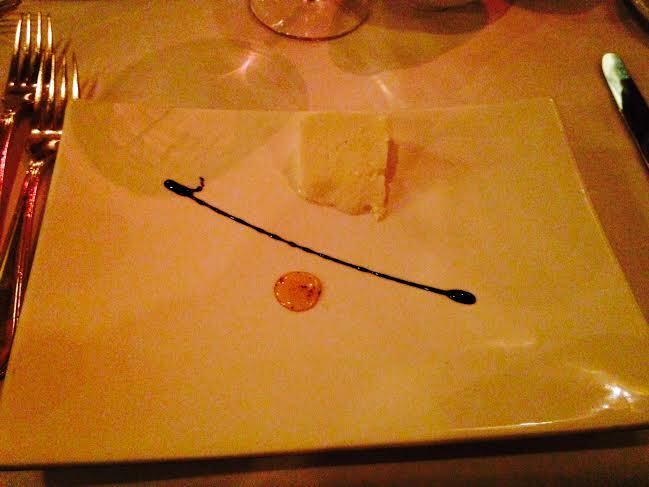 The amuse-bouche was a beautiful cheese served with a balsamic reduction and drizzled with honey. It worked much better than my picture did. 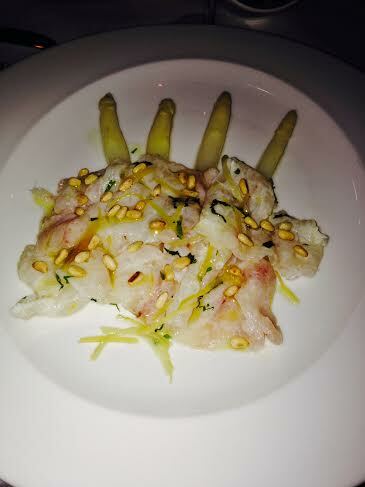 For an appetizer I ordered the grouper carpacio atop white asparagus, topped with pine nuts and seasoned with citrus. It was quite a sizable portion and was more like a ceviche. It wasn’t the prettiest dish and probably would have benefited from a little colour and/or spice. Maybe some green asparagus instead of white might have worked. Other than the appearance, I enjoyed it but there was way too much. Also at the table was the grilled squid w/fresh coriander, lemon, garlic, extra virgin olive oil served with roasted sweet peppers, charred tomato and caramelized leeks. It was a very well executed dish and rivaled any calamari those Italians make. Once again, it was simply presented but lacked a visual punch. I like the thought of playing with my food so I tackled the whole ocean perch. I was also sold on the promise of a large and tasty cheek. The fish arrived with the token potato and vegetable side. The ocean perch is quite bony so I felt a bit like a nervous surgical intern, especially when I offered a piece to a colleague at the table and failed to remove all the bones. I think the waiter sensed my frustration and politely offered to remove the other cheek for me. With my knife and fork he worked with a surgical precision and pulled out a large cheek which made the whole experience worth it. I had an indecisive friend sitting beside me who ordered the sampling plate. Much to my delight, she was kind enough to share a little of her octopus, monkfish and skate. 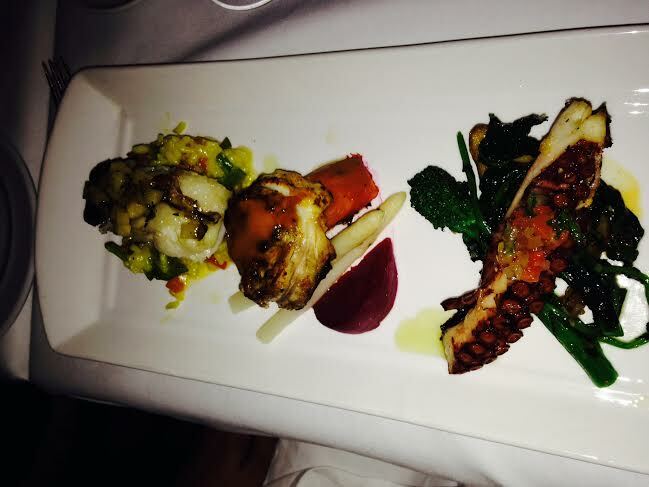 The skate and octopus were delicious but the monkfish stole the show. It was easily the best thing I ate all night. I was tempted to cause a distraction to swipe the remaining filet but kept my composure. As an afterthought I should have showed her a picture of a monkfish and asked her if she actually felt comfortable eating one of the ugliest fish on the planet. Damn hindsight. 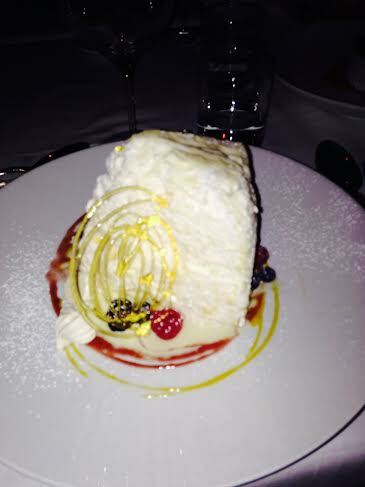 For dessert, I went for the molotof which was described as a light meringue of egg whites served with vanilla cream sauce. The irony of this is that I think meringue is one of the most ridiculous food trends going but I was intrigued by the promise of the lightness compared to the brick hard meringue served everywhere else. It was a good call. Unlike the starters, it was presented pretty. It was light and delicious and my friend cashed in the IOU on the monkfish and scooped a few bites. 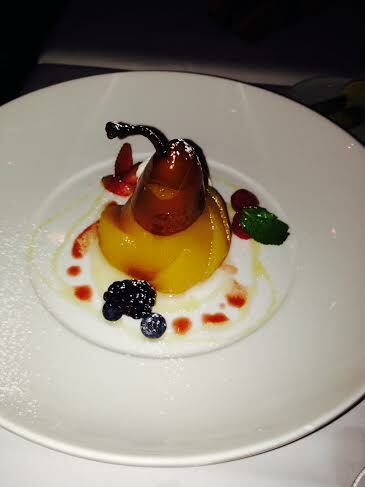 She ordered the peras cozidas (poached pears with Madeira wine, citrus, cinnamon and saffron). The pears were attractive, fresh and laced with punchy, spicy flavour. I don’t mean to pick on Portugal but they are an easy target just like us Canadians (plus I haven’t forgiven them for ending England’s slim world cup dreams in 2006). The food, however, is underrated. It has the same philosophy as Spain and Italy in that it focuses on the freshness of the ingredients. As for Chiado, it’s a cozy place which nicely represents the beauty of what the ocean and Portugal has to offer. I agree with the reviews which question the prices but I can’t agree with those who call the service cold and pretentious. I found it professional and if anything confident, especially when he dissected my fish with the precision of Cristiano Ronaldo. Speaking of which, a few more monkfish filets may make me forgive him for scoring one of the penalty kicks that knocked England out of the world cup for good 8 years ago.